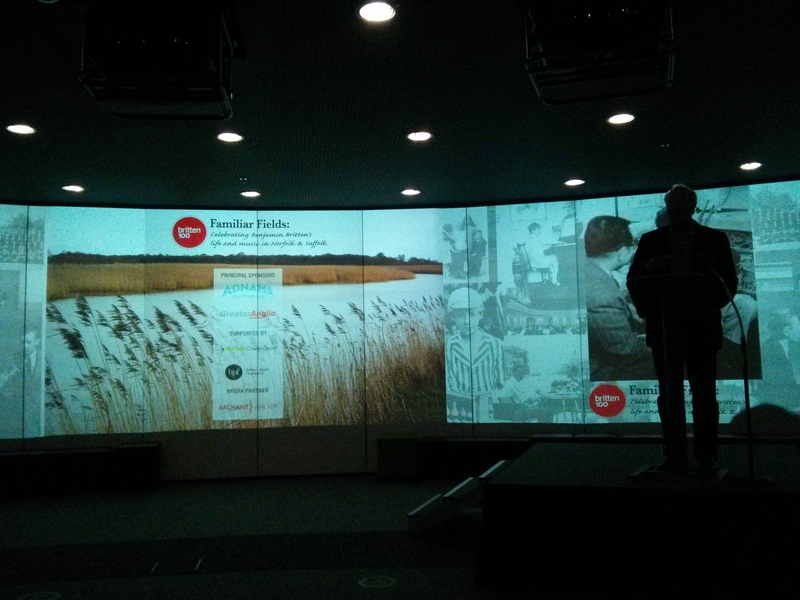 Last night I went to celebratory event and the launch of ‘Britten at the Forum’, to look back over the past 15 months or so of events and to celebrate the centenary which is on Friday 22 November to be precise – we have been building up for nearly two years with events collected under the Familiar Fields umbrella. There have been events across the world, and Radio 4 have been broadcasting lots of Britten themed articles and programmes – this celebration of Britten’s life and work certainly seems to have gripped the nation. On Friday 22, schools across the country will sing Britten’s Friday Afternoon songs and a free online resource has been developed for anyone wanting to join this project, with the opportunity to load up recorded performances. Schools, venues, arts organisations, choirs and music services throughout the UK are joining in so if you want to join to go to www.fridayafternoonmusic.co.uk. As well as this, check out http://www.familarfields.org for events near you, or pick up one of the events guides produced by Familiar Fields which lists all centenary performances. Saturday 23 Nov – Chamber music and songs at the John Innes Centre with cellist Natalie Clein, counter-tenor (and patron of Familiar Fields) Michael Chance and the Carducci Quartet. A presentation of Britten’s diaries and letters ‘Into your satisfaction’ on 19 November, a performance of the ‘Hymn to St Cecilia’ on 22 Nov (St Cecilia’s Day) and a concert by North Norfolk Chorale which includes Hymn to St Peter (written for St Peter Mancroft Church in Norwich) on 23 November. There are three performances of Noye’s Fludde featuring local schoolchildren in Lowestoft (21, 23 & 24 November) and the Royal Philharmonic Orchestra give a special tribute at the Marina Theatre, Lowestoft on 29 November. In Aldeburgh, where Britten lived and worked for so many years there is a Friday Afternoons concert at 4.30 in Jubilee Hall and in the evening at Snape Maltings, the BBC Symphony Orchestra and chorus will be playing. See www.aldeburgh.co.uk/britten. On Saturday 23/Sunday 24, there are concerts in Aldeburgh, Orford and Southwold plus a pop-up exhibition of Britten artefacts in the house he grew up in in Lowestoft. So there really are a lot of opportunities to get to know Britten’s work in the next few days – an unprecedented concentration so I hope that you get to catch up with some of them, and get to know a bit more about one of Britain’s most celebrated composers. This entry was posted in Music in Norwich, The Chapel Park Lane, Uncategorized and tagged Benjamin Britten, britten centenary, britten centenary events, britten events, music in norwich. Bookmark the permalink.